The M2p.65xx-x4 series multi-channel arbitrary waveform generator (AWG) cards uses the high speed Gen2 4-lane PCI express interface. The combination of large on-board memory and ultra fast data upload to the card allows a short or long and complex signal to be generated. The PCIe interface and compact half length PCB are designed to be compatible to many computer and chassis combinations. The latest D/A converter design is utilised and available in two speeds, 40 or 125 mega samples per second. A wide range of speeds up to these limits can be set from software with a fine granularity of 1Hz. Updates are simultaneous and D/A resolution high at 16 bits. This results in an exceptional combination of speed and resolution without the penalty of low signal amplitude. 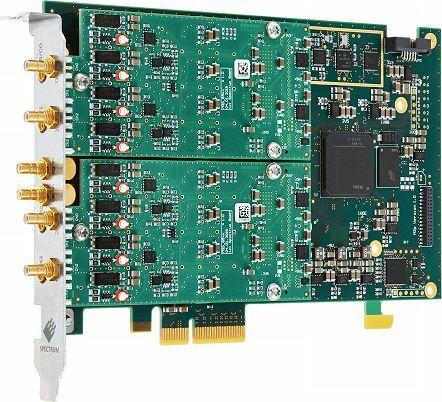 Using the Star-Hub option this card can be precisely synchronised to other Spectrum M2p.65xx cards to provide an increased number of channels. An 8 channel version of the card will be released shortly and up to 16 cards can be connected using the Star-Hub! Versatile Windows / Linux drivers provide a means of programming the AWG in text code, MATLAB, LabVIEW and LabWindowsCVI. Whilst this card series uses the latest technology, they are still software compatible with the drivers from earlier Spectrum waveform generator cards. Hence existing customers can use the same software they developed for an earlier Spectrum M2i AWG card with just a few code tweaks. Extensive support for text programming includes Visual C++, Borland C++, Gnu C++, LabVIEW, MATLAB, Visual Basic, VB.NET, C#, J# and Delphi code. Require even greater AWG speed? M4i.66xx-x8 series can provide this! SCAPP software - Access a CUDA-based GPU directly from the AWG card. A powerful way to pre-process signal data. †Depends also on the programmable filter cut-off frequency setting. For general information about signal generators, sampling, bandwidth and other terminology, click here.